Of course, the *real* Easter is not about the bunny, but ALL about the Lamb. I have been reflecting all week on those events that happened so long ago that changed the world forever. "Where, O death, is your victory? Where, O death, is your sting?" (1 Corinthians 15:55). I'm so grateful that He loved us that much! He is risen indeed! It is my prayer that we will realize His resurrection power in our everyday lives. Every. Single. Day. 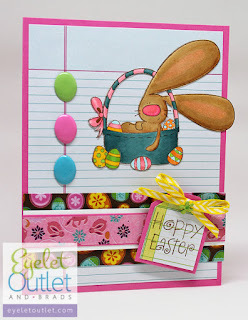 When my box of goodies arrived from the Eyelet Outlet, I found myself digging through my stash of papers and stamps with a fresh perspective. It's so fun to have new "toys" to play with, but it's nice to revisit the old stuff too...besides, it's "green" for the earth and for the pocketbook! 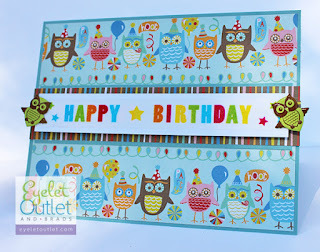 I made this simple card using designer paper from an old designer paper pad and some cute new pastel owl brads. 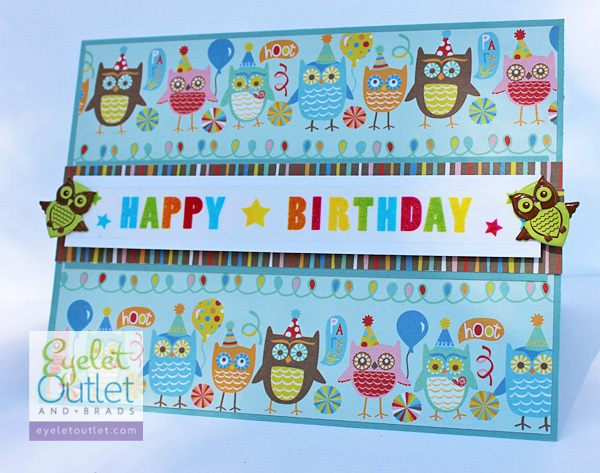 The washi tape greeting on the front was fast and simple to put together and, with a border of striped paper, was framed perfectly by the design of the layer underneath. 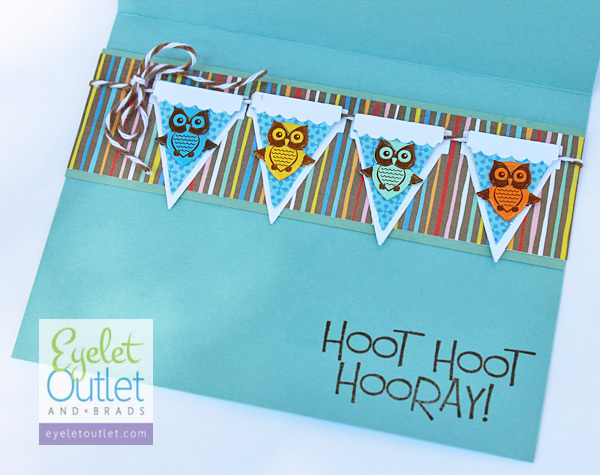 The inside is just as cute as the outside, too! The banner was die-cut with some My Favorite Things dies; the sentiment is from The Stamps of Life. I hope I've inspired you to take a look through the Eyelet Outlet store and then through your stash to see what new ideas come to mind!